NOTE: This trail is closed in Summer 2014 as access is blocked by construction at the Madison Historical Society building. Parking is easiest at the Madison Church, located just north of the junction of East Madison Rd and Route 113. Once out of the parking lot, turn right and head about two-hundred yards down the road, cross over to East Madison Rd, and find the Madison Historical Society (the Granville Homestead.) The trail begins behind this building. You will notice a guest book at the start of the trail, please sign in. The forest around the trail begins as mixed hardwood. Try to spot the change, noticing how undergrowth vanishes as you continue along the trail. Watch out for poison ivy on the first stretch of the trail, around the old well on your left. The trail cuts through a clearing of tiny pines, and it is easy to lose the trail in there. Once you are out of the pines, however, the trail is once again clear. Keep your eyes peeled for Lady Slippers in the spring and summer! The trail descends slightly after the pine clearing, and there is a stream crossing once the ground levels out. You can leap across, or use the stepping-stones. Soon the trail will climb moderately then the ground levels out into a ridge. You can look down onto Forest Brook from here. After reaching the top of the ridge, you will see the trail fork. 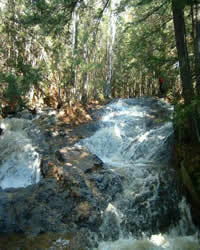 The right path is steep and takes you down to the Madison Cascades. There are many flat rocks by the Cascades and shallow water. The left will take you through some lovely woods, past a grassy clearing, and end at an old class 6 road. This entry was posted in Madison Cascades on July 22, 2008 by madisonhiker.